On Monday we were faced with a public holiday in Canberra but across the border it was a normal working day. Hooray Taph said. Let’s go op-shopping across the border. So we piled into the sub-zero, and set a course for Queanbeyan. Our first stop was the Red Shield Store on Morrisett Street. Fate seems to shine on us as we got rock-star parking outside the door. However the fate gods left us as there was nothing there that followed us home. However, they do have a good supply of 4xl and 6xl Mens S/S Shirts. 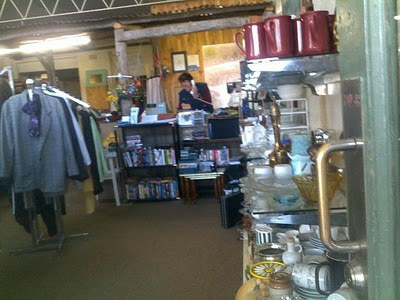 We did a short walk to the Salvos Store, and all we found there was a Country road linen shirt and a jar. Feeling that the Frugaling gods would shine on us at our next two stops, we moved the car closer, and were rewarded with another Rock-Star Car Park. Taph picked up a jumper, and a vintage knitting patten. I found a CD for the Collection. But our luck ran out at Bargin Hunter, and we left empty handed. 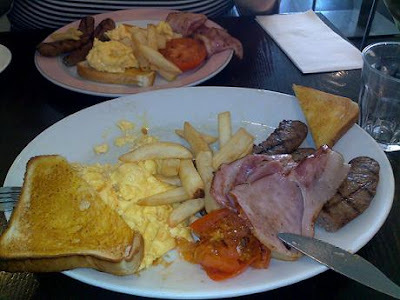 We had a quick Brunch at the Central Café as we shared a Big Breakfast. A quick visit to SpotLight for some needles, also turned up some bargain wool. We were finished in Queanbeyan by 12, so we set course for Cooma. Our first visit was to the Red Shield store. For the grand total of $10 we got a shirt each, a Tupperware mixing bowl, some genuine Croqs and a selection of knitting patterns. 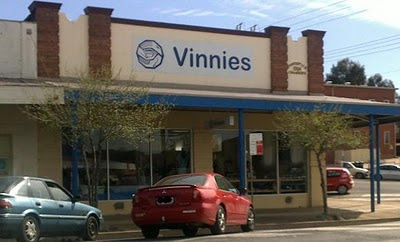 We headed down to the Vinnies and got a Book, Shirt and knitting pattern. 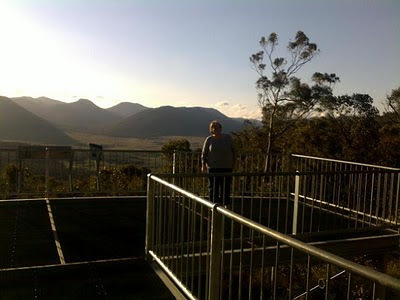 We decided the day was still young, and Adaminaby was 30 minutes away. The cruise control on the Sub-Zero got us there well before closing. 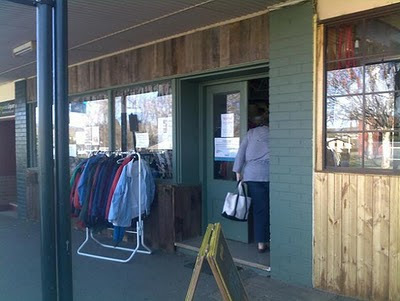 It is easy to find, there is one main shopping street, and it is supporting the Snowy Mountains Museum. We had a lovely time inside. I picked up a pair of xc-skis for $5. The Bases are shot, but I will use the bindings on another pair of skis. Taph got a pure wool jumper, Tupperware rock and serve, Cheese knives and a cook book. All up this cost us $11.50. We took the back road home via Namadgi national park. It is a lovely road, but don’t do it if you are in a hurry. A couple of weeks ago TSS received this email asking why we did not have Take 2 on our list. So Taph and I had to pay it a visit. Our first attempt was on a Monday, when the shop was closed. We had a look through the windows and decided we must visit again. A couple of weeks later we were driving down Limestone Avenue at 11:50 on a Saturday morning, we found our car gripped by a strange force, and we found ourselves parked in the All Saints car park. 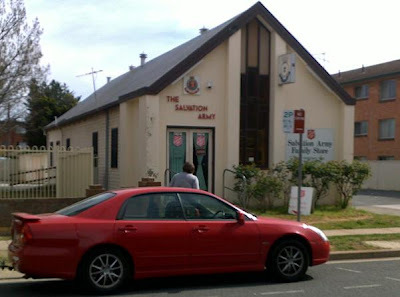 From there it is a short stroll over to the op shop that is located next to the church hall. 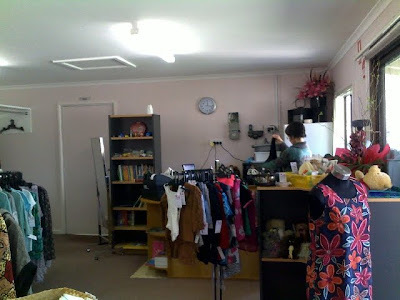 It was not the smallest op-shop i have been in, however that op-shop was located in a one-horse country town. Its mens wear range was very limited, but happily very cheap. The shirt i bought was only $1. According to Taph, it womens wear range is limited but select, with the stock they have being good brands. 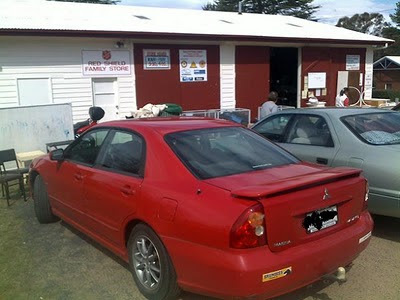 While at the R-shop in Mitchell recently, i noticed that they were extending the shed and also putting in a verandah. It looked to me like the shed size has been increased by a 40 meter extension. And the verandah would almost double the space the have under cover. This means even more stock will be stored under cover. I asked one of the staff there about it. 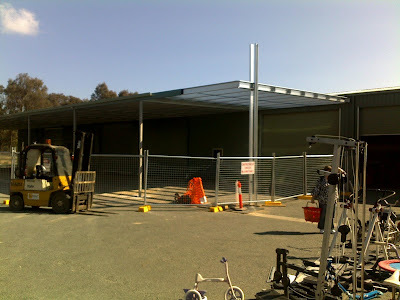 They said the building were still owned by the ACT Government and they were doing these improvements as they were going to be tendering for the recycling business again in April. Taph and i are fans of "Tinys Green Shed" on Facebook. However a couple of weeks ago we were gobsmacked by the post on his site. Free clothes, Taph was thrilled by this prospect, and i was mildly excited, so we set off to see what we could find. 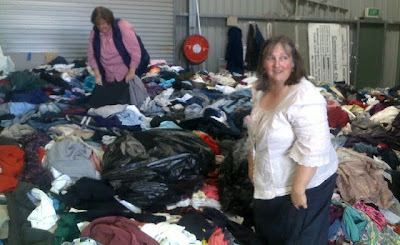 When we found the magic mountain of clothes, the lucky dip that was just piled up on the floor, we decided the best thing to do was just start digging and see what turned up. Clothing that fitted either of us. While we were there we met a nice lady who was after babies clothes for Karinya House. So all afternoon when ever we found something that was baby wear, the call went up, "Baby" and the items of clothing were thrown over to where she was. After a few hours of searching, we left with several bags of clothing that fitted our search requirements. On the wearable clothing front I picked up a couple of nice shirts, a pair of shorts and a nice black jacket. 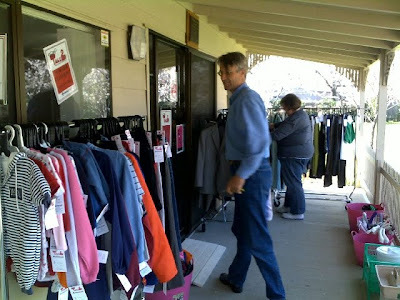 "I am a regular reader of the blog and I thought that I would let you know that Barneys Boutique in Charnwood are having their winter sale and all the clothes are reduced to a dollar each. 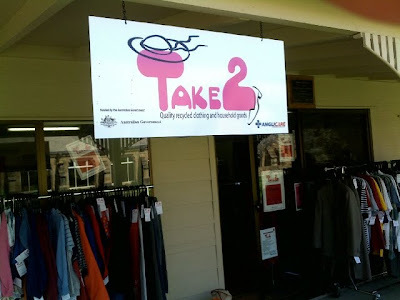 There are some great bargains to get--my husband got a new woolen dressing gown (Smartex brand) yesterday and a mans pullover for a $1.00 each both in excellent condition. I thought you might like to pass this on to the readers. We had some great finds at Fash'n'Treasure on Saturday. The two bags and the pair of shoes totalled $15. Felt was selling three items for $20. The black leather bag is a Pink Corporation brand, I cleaned it up at home with some shoe polish and cut off a few stray threads. I may have to take to a boot maker to have the eyelets replaced - but I think it will be worth it as it is a great style. Apparently by the end of the day a lot of the sellers were selling items for $2 a piece. The next market is on 27 November.